Michael, Summer, Brian, and Mary field a question about when's the right time for a writer to use a pseudonym, and after a long discussion, we still don't have a real answer, but most of us think it's a dead or dying practice. 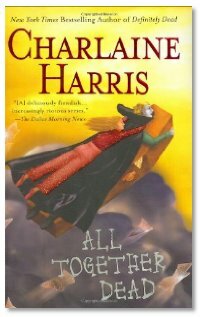 Interview: Michael, Summer, Brian and Mary welcome Charlaine Harris to the studio, since she's stopped in Phoenix during the book tour for All Together Dead, the latest in her Southern Vampire series. Charlaine tells us how she moved from writing conventional mysteries to writing what she calls rural fantasy, the building of the universe that Sookie inhabits, and working with the characters Sookie Stackhouse and Harper Connelly. She also tells us a little about the adaptation of the Southern Vampire series into "True Blood", the original series for HBO, written and produced by Alan Ball, and how excited she is to see the sets being built to bring to life the world in her books, and how happy she is that Alan really "gets it", how she's happy with the casting and the storyline so far. She's coming back to Phoenix in September as the Guest of Honor for CopperCon, and will be in Saratoga Springs in November to attend World Fantasy Con. The Library: New arrivals to the studio this time around: Wraith by Phaedra Weldon, Strange Candy by Laurell K. Hamilton, Magic Lost, Trouble Found by Lisa Shearin, The Man With the Golden Torc by Simon R. Green, Breakaway by Joel Shepherd, The Harlequin by Laurell K. Hamilton, Brasyl by Ian McDonald, Changeling by Yasmine Galenorn, Foundling: Monster Blood Tattoo by D. M. Cornish, Heart of Valor by Tanya Huff, Daughter of the Blood by Anne Bishop, Key to Conflict by Talia Gryphon. Listener Feedback: What books changed your life, and what books are your A+ books? Keep letting us know what your personal essential books are! I definitely agree with you re: Fionavar Tapestry. I haven't read it for years but I was totally captivated by that series. LotR just couldn't engage me as much - maybe I was too young for the series but it took me three months to slog through it. Fionavar is probably due for a re-read. I loved how the characters developed and sometimes went in unexpected directions. I even liked the Arthurian elements! I usually avoid Arthurian stories (surely that's been more than done) but I really liked that addition to the story. I'm a big GGKay fan though. I prefer stand-alone novels so I've read his stand-alones more than the Fionavar (though it's fun how all his novels tie back to Fionavar's Tapestry in some way). Tigana and Lions of Al-Rassan are two of my personal A+ books (Lions still makes me tear up in the final battle scene). Great stuff. Thanks for answering my question about pseudonyms - I agree with everything said, and basically pseudonyms are old fashioned and there is no real need to use them. Which means, I assume, that they also don't need to be used if your name is unusual or difficult to spell and/or pronounce, which was really the focus of my question (which Mike skipped!). Mike couldn't get my surname correct when he tried to read it at the top of the show, which was basically the point I was trying to make. If you want readers to find you in a bookstore or on a library catalogue, is it any harder for them to do if they can't spell or say your name? So rather than an artistic reason for using a pseudonym, it's a purely practical and economic one - you want people to find you easily because if they can, the chances of them buying your book and earning you some more money are higher than if they walk into a store, can't find you on the shelf, and have no luck asking a store attendant because you can't say or spell the name, and walk out with somebody else's book! Great show as usual. Not familiarwith the author but she was a treat to listen to. Loved her perspective on the business and her position within it plus her outlook on life. Anna Paquin cast in the lead for the series really piques my interest. I read Lord of the Rings when I was 14 or 15 and like everybody else I loved it. I re-read it 35 years later and could barely finish it. LotR is still a magnificent achievement; unfortunately it is an achievement I no longer find interesting. Blame it on aging, not maturation. I grow old but not up. On the other hand, I recently re-read Zelazny's Amber series after 30+ years and liked it even more than the first time. So, as a tangent off your A+ book series, are there books that you loved previously but now, not so much?